I don't remember much. I believe it was an afternoon showing. We were probably relatively sober. During the film I felt that the audience was reacting to scenes in ways that I was "missing"-- for example, I just didn't see why some events were being laughed at or grumbled about etc. It was one of those events where overall I just didn't feel like I fit in somehow. And, of course, when the lights came up at the end it was obvious: we were among a handful of white folks in an otherwise black audience. Obviously whites and blacks responded differently to scenes in the film, and for a couple of Canadian visitors to Chicago from Vancouver Island, it was an eye-opening experience. 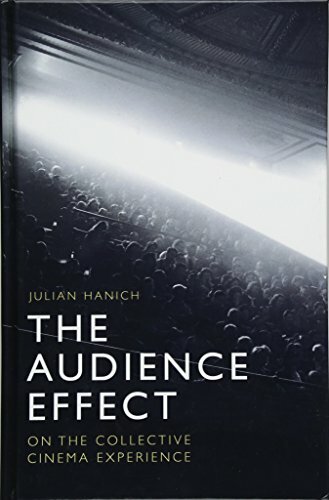 Hanich's book helps one understand the many and complex ways in which the audience effect works as a contributor to the cinematic experience. As he points out in the introduction "Phenomenology is a method that examines structures of experience, thus supplanting merely impressionistic, overly subjectivist accounts." (11). He sets out to theorize and describe "the viewer relations of the cinema as a subjectively lived experience from a social I-You or we perspective." Phenomenology, of course, is the study of structures of consciousness as experienced from the first-person point of view. The important structure of an experience is its intentionality, its being directed toward something, as it is an experience of or about some object – in this case the film being experienced in the cinema with an audience. The discipline of phenomenology seems the appropriate discipline to employ to study audience effect on the overall personal experience of the film - the study of structures of experience, or consciousness. First comes the experience and then the discussion or critique of the particular film experienced. In the introduction we are provided the "upshots of this book": 1. Enriching the viewing experience; 2. Raising media competency; 3. Laying a groundwork for empirical research. The book definitely achieves these goals. As one would expect from the Edinburgh University Press the book is a study in professional publishing complete with extensive end notes, clear chapter titles, a useful introduction, acknowledgments, a list of figures (always useful), and a cool cover! The glossary provides a wealth of information and definition to help the reader get the most from the discussion. For example, the entry for "Cinema" reads as follows: The minimal, a-historical definition of a prototypical cinema used for the purpose of this book presupposes a dark, public auditorium separated by a threshold from the outside world, in which viewers find themselves in the -> co-presence of other viewers, follow the uninterrupted projection of a film, and are aware of site-specific behavioral rules. Historically and culturally specific movie-theaters deviate from this a-historical prototype. (285) In fact, I would recommend that the reader begin by reading the glossary to become familiar with the phenomenological vocabulary employed through out the book's many chapters. Near the end of the book Hanich discusses a situation not unlike the one I mentioned at the beginning of this short review – in a brief discussion of the different responses to a black character in a Tarzan movie – responses triggered by the make up of the audience. Each chapter is carefully researched. There are many lists which make subtle distinctions. There are references to many films. There are a few pictures. For those looking to learn more about the complex responses of audiences of cinematic art this is the book you should consult.